Ilocano (also Ilokano; /iːloʊˈkɑːnoʊ/; Ilocano: Pagsasao nga Ilokano) is the third most-spoken native language of the Philippines. An Austronesian language, it is related to such languages as Indonesian, Malay, Fijian, Maori, Hawaiian, Malagasy, Samoan, Tahitian, Chamorro, Tetum, and Paiwan. It is closely related to some of the other Austronesian languages of Northern Luzon, and has slight mutual intelligibility with the Balangao language and Eastern dialects of the Bontoc language. In September 2012, the province of La Union passed an ordinance recognizing Ilokano (Iloko) as an official provincial language, alongside Filipino and English, as national and official languages of the Philippines, respectively. It is the first province in the Philippines to pass an ordinance protecting and revitalizing a native language, although there are also other languages spoken in the province of La Union, including Pangasinense and Kankanaey. 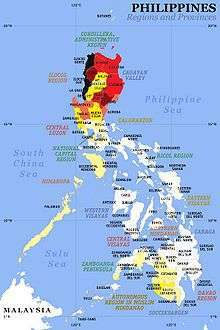 Ilocano, like all Philippine languages, is an Austronesian language, a very expansive language family believed to originate in Taiwan. 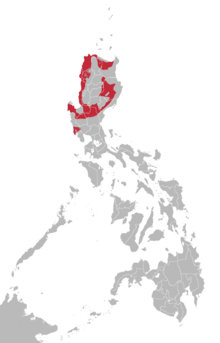 Ilocano comprises its own branch within the Philippine Cordilleran language subfamily. It is spoken as first language by seven million people. A lingua franca of the northern region of the Philippines, it is spoken as a secondary language by more than two million people who are native speakers of Pangasinan, Ibanag, Ivatan, and other languages in Northern Luzon. Ilokano-speaking density per province. Enlarge picture to see percent distribution. The language is spoken in northwest Luzon, the Babuyan Islands, Cagayan Valley, Central Luzon, and areas of Mindanao. The language is also spoken in the United States, with Hawaii and California having the largest amount of speakers. It is the third most spoken non-English language in Hawaii after Tagalog and Japanese, with 15% of households speaking the language. Our Father prayer from Doctrina Cristiana, 1621. In recent times, there have been two systems in use: The "Spanish" system and the "Tagalog" system. In the Spanish system words of Spanish origin kept their spellings. Native words, on the other hand, conformed to the Spanish rules of spelling. Nowadays, only the older generation of Ilocanos use the Spanish system. In the system based on that of Tagalog there is more of a phoneme-to-letter correspondence, and better reflects the actual pronunciation of the word. [lower-alpha 1] The letters ng constitute a digraph and counts as a single letter, following n in alphabetization. As a result, numo humility appears before ngalngal to chew in newer dictionaries. Words of foreign origin, most notably those from Spanish, need to be changed in spelling to better reflect Ilocano phonology. Words of English origin may or may not conform to this orthography. A prime example using this system is the weekly magazine Bannawag. The following are two versions of the Lord's Prayer. The one on the left is written using the Spanish-based orthography, while the one on the right uses the Tagalog-based system. With the implementation by the Spanish of the Bilingual Education System of 1897, Ilocano, together with the other seven major languages (those that have at least a million speakers), was allowed to be used as a medium of instruction until the second grade. It is recognized by the Commission on the Filipino Language as one of the major languages of the Philippines. Constitutionally, Ilocano is an auxiliary official language in the regions where it is spoken and serves as auxiliary media of instruction therein. In recent years, a movement in both the Lower and the Upper House of the Congress pressed for the usage of the mother tongue as a medium of instruction until the sixth grade. Ilocano animistic past offers a rich background in folklore, mythology and superstition (see Religion in the Philippines). There are many stories of good and malevolent spirits and beings. Its creation mythology centers on the giants Aran and her husband Angngalo, and Namarsua (the Creator). The epic story Biag ni Lam-ang (The Life of Lam-ang) is undoubtedly one of the few indigenous stories from the Philippines that survived colonialism, although much of it is now acculturated and shows many foreign elements in the retelling. It reflects values important to traditional Ilokano society; it is a hero's journey steeped in courage, loyalty, pragmatism, honor, and ancestral and familial bonds. Ilocano culture revolves around life rituals, festivities and oral history. These were celebrated in songs (kankanta), dances (sala), poems (daniw), riddles (burburtia), proverbs (pagsasao), literary verbal jousts called bucanegan (named after the writer Pedro Bucaneg, and is the equivalent of the Balagtasan of the Tagalogs) and epic stories. Modern Ilocano has two dialects, which are differentiated only by the way the letter e is pronounced. In the Amianan (Northern) Dialect, there exist only five vowels while the Abagatan (Southern) Dialect employs six. The letter in bold is the graphic (written) representation of the vowel. For a better rendition of vowel distribution, please refer to the IPA Vowel Chart. Unstressed /a/ is pronounced [ɐ] in all positions except final syllables, like madí [mɐˈdi] (cannot be) but ngiwat (mouth) is pronounced [ˈŋiwat]. Although the modern (Tagalog) writing system is largely phonetic, there are some notable conventions. In native morphemes, the close back rounded vowel /u/ is written differently depending on the syllable. If the vowel occurs in the ultima of the morpheme, it is written o; elsewhere, u. Instances such as masapulmonto, You will manage to find it, to need it, are still consistent. Note that masapulmonto is, in fact, three morphemes: masapul (verb base), -mo (pronoun) and -(n)to (future particle). An exception to this rule, however, is laud /la.ʔud/ (west). Also, u in final stressed syllables can be pronounced [o], like [dɐ.ˈnom] for danum (water). The two vowels are not highly differentiated in native words due to fact that /o/ was an allophone of /u/ in the history of the language. In words of foreign origin, notably Spanish, they are phonemic. Unlike u and o, i and e are not allophones, but i in final stressed syllables in words ending in consonants can be [ɛ], like ubíng [ʊ.ˈbɛŋ] (child). The two closed vowels become glides when followed by another vowel. The close back rounded vowel /u/ becomes [w] before another vowel; and the close front unrounded vowel /i/, [j]. In addition, dental/alveolar consonants become palatalized before /i/. (See Consonants below). Unstressed /i/ and /u/ are pronounced [j] and [ʊ] except in final syllables, like pintás (beauty) [pɪn.ˈtas] and buténg (fear) [bʊ.ˈtɛŋ] but bangir (other side) and parabur (grace) are pronounced [ˈba.ŋiɾ] and [pɐ.ˈɾa.buɾ]. The letter ⟨e⟩ represents two vowels in the non-nuclear dialects (areas outside the Ilocos provinces) [ɛ] in words of foreign origin and [ɯ] in native words, and only one in the nuclear dialects of the Ilocos provinces, [ɛ]. Diphthongs are combination of a vowel and /i/ or /u/. In the orthography, the secondary vowels (underlying /i/ or /u/) are written with their corresponding glide, y or w, respectively. Of all the possible combinations, only /aj/ or /ej/, /iw/, /aj/ and /uj/ occur. In the orthography, vowels in sequence such as uo and ai, do not coalesce into a diphthong, rather, they are pronounced with an intervening glottal stop, for example, buok hair /bʊ.ʔuk/ and dait sew /da.ʔit/. /iu/ iw iliw "home sick"
/oi/, /ui/[lower-alpha 3] oy, uy baboy "pig"
The diphthong /ei/ is a variant of /ai/ in native words. Other occurrences are in words of Spanish and English origin. Examples are reyna /ˈɾei.na/ (from Spanish reina, queen) and treyner /ˈtɾei.nɛɾ/ (trainer). The diphthongs /oi/ and /ui/ may be interchanged since /o/ is an allophone of /u/ in final syllables. Thus, apúy (fire) may be pronounced /ɐ.ˈpui/ and baboy (pig) may be pronounced /ˈba.bui/. All consonantal phonemes except /h, ʔ/ may be a syllable onset or coda. The phoneme /h/ is a borrowed sound and rarely occurs in coda position. Although, the Spanish word, reloj, clock, would have been heard as [re.loh], the final /h/ is dropped resulting in /re.lo/. However, this word also may have entered the Ilokano lexicon at early enough a time that the word was still pronounced /re.loʒ/, with the j pronounced as in French, resulting in /re.los/ in Ilokano. As a result, both /re.lo/ and /re.los/ occur. The glottal stop /ʔ/ is not permissible as coda; it can only occur as onset. Even as an onset, the glottal stop disappears in affixation. Take for example the root aramat [ʔɐ.ra.mat], use. When prefixed with ag-, the expected form is *[ʔɐɡ.ʔɐ.ra.mat]. But, the actual form is [ʔɐ.ɡɐ.ra.mat]; the glottal stop disappears. In a reduplicated form, the glottal stop returns and participates in the template, CVC, agar-aramat [ʔɐ.ɡar.ʔɐ.ra.mat]. Stops are pronounced without aspiration. When they occur as coda, they are not released, for example, sungbat [sʊŋ.bat̚] answer, response. Ilokano is one of the Philippine languages which is excluded from [ɾ]-[d] allophony, as /r/ in many cases is derived from a Proto-Austonesian */G/, compare dugô (Tagalog) and dara (Ilokano) blood. The language marginally has a trill [r] which was spelled as "rr", for example, serrek [sɛ.ˈrɛk] to enter. But it is different in proper names of foreign origin, mostly Spanish, like Serrano, which is correctly pronounced [sɛ.ˈrano]. Some speakers, however, pronounce Serrano as [sɛ.ˈɾano]. The placement of primary stress is lexical in Ilocano. This results in minimal pairs such as káyo (wood) and kayó (you (plural or polite)) or kíta (class, type, kind) and kitá (see). In written Ilokano the reader must rely on context, thus kayo and kita. Primary stress can fall only on either the penult or the ultima of the root, as seen in the previous examples. While stress is unpredictable in Ilokano, there are notable patterns that can determine where stress will fall depending on the structures of the penult, the ultima and the origin of the word. CVC. 'CV(C)# but 'CVŋ.kV(C)# – In words with a closed penult, stress falls on the ultima, except for instances of /-ŋ.k-/ where it is the penult. 'C(j/w)V# – In words whose ultima is a glide plus a vowel, stress falls on the ultima. C.'CV:.ʔVC# – In words where VʔV and V is the same vowel for the penult and ultima, the stress falls on the penult. Syllables whose coda is the onset of the next, i.e., the syllable before a geminate. Vowel length coincides with stressed syllables (primary or secondary) and only on open syllables, for example, kayo /'ka:.yo/ tree and kayo /ka. 'yo/' (second person plural ergative pronoun). Ilokano is typified by a predicate-initial structure. Verbs and adjectives occur in the first position of the sentence, then the rest of the sentence follows. Ilocano uses a highly complex list of affixes (prefixes, suffixes, infixes and enclitics) and reduplications to indicate a wide array of grammatical categories. Learning simple root words and corresponding affixes goes a long way in forming cohesive sentences. An Ilocano Dictionary by Morice Vanoverbergh, CICM, published in 1955 by the CICM Fathers in Baguio City to help them in evangelizing in Ilocandia. Foreign accretion comes largely from Spanish, followed by English and smatterings of much older accretion from Hokkien (Min Nan), Arabic and Sanskrit. kumusta Spanish greeting: ¿Cómo está? ("How are you?") How are you? Ilokano shows a T-V distinction. Good day Naimbag nga aldaw. Good morning Naimbag a bigatmo. Good afternoon Naimbag a malemmo. Good evening Naimbag a rabiim. Where's the bathroom? Ayanna ti banio? I do not understand Saanko a maawatan/matarusan. Ilocano uses two number systems, one native and the other derived from Spanish. Luktanyo dagiti Bibliayo iti libro ni Juan kapitulo tres bersikolo diesiseis. Open your Bibles to the book of John chapter three verse sixteen. Mano a kilo ti bagas ti kayatmo? How many kilos of rice do you want? Adda dua na nga sida. Days of the week are directly borrowed from Spanish. Like the days of the week, the names of the months are taken from Spanish. The names of the units of time are either native or are derived from Spanish. The first entries in the following table are native; the second entries are Spanish derived. aysus!/ Ay Apo! = oh, Jesus/oh, my God! ↑ However, there are notable exceptions. The reverse is true for the vowel /u/ where it has two representations in native words. The vowel /u/ is written o when it appears in the last syllable of the word or of the root, for example kitaemonto /ki.ta.e.mun.tu/. In addition, e represents two vowels in the southern dialect: [ɛ] and . ↑ The diphthong /ei/ is a variant of /ai/. ↑ The distinction between /o/ and /u/ is minimal. ↑ the symbol '∅' represents zero or an absence of a phoneme. ↑ Ilocano syllables always begin with a consonant onset. Words that begin with a vowel actually begin with a glottal stop ('[ʔ]'), but it is not shown in the orthography. When the glottal stop occurs within a word there are two ways it is represented. When two vowels are juxtaposed, except certain vowel combinations beginning with /i/ or /u/ which in fact imply a glide /j/ or /w/, the glottal stop is implied. Examples: buok hair [buː.ʔok], dait sew [daː.ʔit], but not ruar outside [ɾwaɾ]. However, if the previous syllable is closed (ends in a consonant) and the following syllable begins with a glottal stop, a hyphen is used to represent it, for example lab-ay bland [lab.ʔai]. 1 2 3 4 5 6 7 Letters in parentheses are orthographic conventions that are used. ↑ Spanish permits stress to fall on the antepenult. As a result, Ilokano will shift the stress to fall on the penult. For example, árabe an Arab becomes arábo in Ilocano. 1 2 3 Elias, Jun (19 September 2012). "Iloko La Union's official language". Philippine Star. Retrieved 24 September 2012. ↑ Hammarström, Harald; Forkel, Robert; Haspelmath, Martin; Bank, Sebastian, eds. (2016). "Iloko". Glottolog 2.7. Jena: Max Planck Institute for the Science of Human History. ↑ Ethnologue. "Language Map of Northern Philippines". ethnologue.com. Ethnologue. Retrieved 7 December 2015. 1 2 Galvez Rubino, Carl Ralph (2000). Ilocano Dictionary and Grammar: Ilocano-English, English-Ilocano. University of Hawai'i Press. ISBN 0-8248-2088-6. ↑ Lewis, M. Paul; Simmons, Gary F; Fennig, Charles D. "Ethnologue: Languages of the World, Eighteenth edition". SIL International. Retrieved 17 December 2015. ↑ Rubino, Carl (2005). "Chapter Eleven: Iloko". In Adelaar, Alexander. The Austronesian Language of Asia and Madagascar. Himmelmann, Nikolaus P. Routledge. p. 326. ISBN 0-7007-1286-0. ↑ "The Non-English Speaking Population in Hawaii" (PDF). State of Hawaii Department of Business, Economic Development & Tourism Research and Economic Analysis Division. p. 4. Retrieved 18 December 2015. ↑ Komisyon sa Wikang Filipino (2012). Tarabay iti Ortograpia ti Pagsasao nga Ilokano. Komisyon sa Wikang Filipino. p. 25. ↑ Panfilio D. Catacataca (April 30, 2015). "The Commission on the Filipino Language". ncca.gov.ph. National Commission for Culture and the Arts. Retrieved 7 December 2015. ↑ Congress of the Philippines (May 15, 2013). "Republic Act No. 10533". ncca.gov.ph. Government of the Philippines. Retrieved 7 December 2015. ↑ Delon Porcalla (May 16, 2013). "K-12 for all, use of mother tongue now law". www.philstar.com. The Philippine Star. Retrieved 7 December 2015. ↑ Vanoverbergh, Morice (1955). Iloco Grammar Catholic School Press/Congregation of the Sacred Heart of Mary, Baguio City, Philippines. 348pp. ↑ Gelade, George P. (1993). Ilokano English Dictionary. CICM Missionaries/Progressive Printing Palace, Quezon City, Philippines. 719pp. ↑ Vanoverbergh, Morice (1956). Iloko-English Dictionary:Rev. Andres Carro's Vocabulario Iloco-Español. Catholic School Press, Congregation of the Immaculate Heart of Mary, Baguio City, Philippines. 370pp. ↑ Vanoverbergh, Morice (1968). English-Iloko Thesaurus. Catholic School Press, Congregation of the Immaculate Heart of Mary, Baguio City, Philippines. 365pp. Wikivoyage has a travel guide for Ilocano phrasebook. Tarabay iti Ortograpia ti Pagsasao nga Ilokano – A free ebook version of the Guide on the Orthography of the Ilokano Language developed by the Komisyon ng Wikang Filipino (KWF) in consultation with various stakeholders in Ilokano language and culture. Developed back in 2012 as a resource material for the implementation of the Department of Education's K-12 curriculum with the integration of MTB-MLE or Mother Tongue-Based Multilingual Education. Mobile Application - TOIDP - Ilokano Search Free – A free Apple iOS mobile application that allows users to search our database of entries. Ilocano.org A project for building an online Ilokano dictionary. Also features Ilokano songs, and a community forum. Ilocano: Ti pagsasao ti amianan – Webpage by linguist Dr. Carl R. Galvez Rubino, author of dictionaries on Iloko and Tagalog. Iluko.com popular Ilokano web portal featuring Ilokano songs, Iloko fiction and poetry, Ilokano riddles, and a lively Ilokano forum (Dap-ayan). mannurat.com blog of an Ilokano fictionist and poet written in Iloko and featuring original and Iloko fiction and poetry, literary analysis and criticism focused on Ilokano Literature, and literary news about Iloko writing and writers and organization like the GUMIL (Gunglo dagiti Mannurat nga Ilokano). dadapilan.com – an Iloko literature portal featuring Iloko works by Ilokano writers and forum for Iloko literary study, criticism and online workshop. Vocabularios de la Lengua Ilocana by N.P.S. Agustin, published in 1849. Tugot A blog maintained by Ilokano writer Jake Ilac.